The pink Les Recettes de l’Atelier bar is Nestlé’s latest innovation in luxury chocolate and is made with chocolate derived from Ruby cocoa beans, which provides an intense berry-fruitiness without the addition of any flavourings or colours. The fruity taste of this Ruby chocolate bar is intensified by the addition of raspberries. 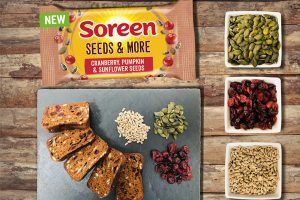 The new Les Recettes de l’Atelier made with Ruby chocolate will be available exclusively in selected Sainsbury’s stores for £3. Ruby chocolate was created by Swiss chocolatier Barry Callebaut after more than a decade of developing the innovative flavour. Nestlé was the first to launch this fourth type of chocolate – after dark, milk and white – to consumers worldwide through KitKat, followed by Baci Perugina Limited Edition. 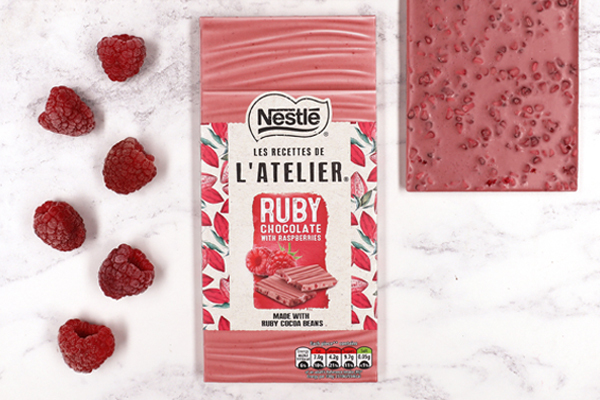 Les Recettes de l’Atelier is the latest Ruby chocolate product released by the company.